Do you ever come across an image of a space that is so good it stops you in your tracks? So good it makes you consider selling and getting rid of everything in a similar space in your home just so you can completely recreate the look for yourself? Because that just happened to me. I mean, I love my living room, but I think I love this one more. That gold coffee table and the gold wall decor and the white sofa and the patterned rug – I just can’t. The lamps and the side tables and the pillows – please!!! 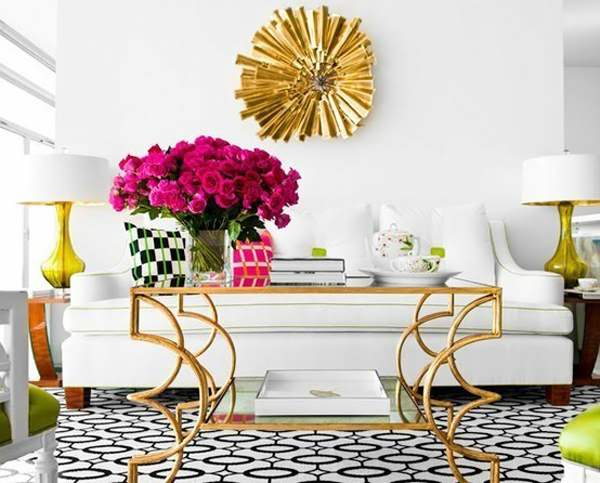 I don’t know what it is about this room that is making me need it, but I’m going to go with the gold coffee table. It’s just fabulous. Well anyway, enough of my rambling, has this ever happened to you? Have you ever acted on it and actually recreated the look for yourself? And if anyone knows more about the room, let me know! I found it on Pinterest which led to a tumblr without any information.